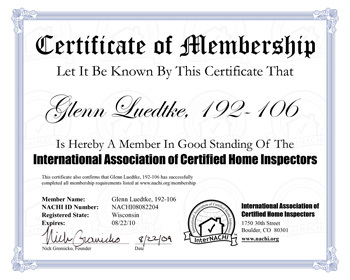 A Comprehensive Home Inspection, Inc. Many houses new and old have decking. The newer ones are commonly built out of PTL (Pressure Treated Lumber) this ensures durability and minimal maintenance. These decks can warp and will occasionally need to be re-nailed. • Posts should be connected to their footings so the posts don’t lift or slip off. • In all but the lowest decks, deck posts should be at least 6” x 6”. • Downspouts should not discharge near the deck posts. This encourages rot. • Handrail height should be between 34 and 38 inches. • Outlets should be moisture and GFCI protected. • Periodically take an awl and probe around your deck especially where the wood meets the ground for soft spots. • Keep your deck stained or painted. This is the time of year when a deck can add enjoyment to your life whether you’re entertaining or just relaxing. With a little attention a deck can be a source of satisfaction for years. This entry was posted by Glenn Luedtke, on Friday, May 3rd, 2013 at 9:09 pm and is filed under Decks, Outside. Comments are currently closed.